A recent market study published by Persistence Market Research titled “Post Herpetic Neuralgia Treatment Market: Global Industry Analysis 2013-2017 & Forecast 2018-2026” consists a comprehensive assessment of the most important market dynamics. On conducting a thorough research on the historic as well as current growth parameters of the Post herpetic neuralgia treatment market, growth prospects of the market are obtained with maximum precision. The report features unique and salient factors that may make a huge impact on the development of the Post herpetic neuralgia treatment market during the forecast period. It can help market players to modify their manufacturing and marketing strategies to envisage maximum growth in the Post herpetic neuralgia treatment market in the upcoming years. The report provides detailed information about the current and future growth prospects of the post herpetic neuralgia treatment market in the most comprehensive way for the better understanding of readers. The report commences with the executive summary of the post herpetic neuralgia treatment market report, which includes the summary of key findings and key statistics of the market. It also includes the market value (US$ million) estimates of the leading segments of the Post herpetic neuralgia treatment market. Readers can find detailed taxonomy and the definition of the post herpetic neuralgia treatment market in this chapter, which helps readers to understand the basic information about the post herpetic neuralgia treatment market dynamics, supply chain, cost structure, pricing analysis, list of key distributor and suppliers, list of key market participants included in the report. Based on the treatment type, the post herpetic neuralgia treatment market is segmented into drugs, patches and steroid injectable. In this chapter, readers can find information about key trends and developments in the post herpetic neuralgia treatment market and market attractive analysis based on the drugs, patches and steroid injectable. In this chapter, readers can find information about key trends and developments in the post herpetic neuralgia treatment market and market attractive analysis based on the product type for each region. Based on the distribution channel, the post herpetic neuralgia treatment market is segmented into institutional sales, and retail sales. In this chapter, readers can find information about key trends and developments in the post herpetic neuralgia treatment market and market attractive analysis based on distribution channel. In this chapter, readers can find information about key trends and developments in the post herpetic neuralgia treatment market and market attractive analysis based on the distribution channel for each region. This chapter explains how the post herpetic neuralgia treatment market will grow across various geographic regions, such as North America, Latin America, Europe, Asia-Pacific Excluding China (APEC), China and the Middle East & Africa (MEA). This chapter includes detailed analysis of the growth of the North America post herpetic neuralgia treatment market along with the country-wise assessment including the U.S. and Canada. Readers can also find regional trends, regulations, and market growth based on treatment type, distribution channel and country of post herpetic neuralgia treatment in the North American region. Readers can find detailed information about factors such as, pricing analysis, and regional trends that are impacting the growth of the Latin America post herpetic neuralgia treatment market. This chapter also includes the growth prospects of the post herpetic neuralgia treatment market in leading LATAM countries such as Brazil, Mexico, Argentina, and rest of the Latin America region. Important growth prospects of the Post herpetic neuralgia treatment market based on its product types, form, and applications in several European countries, such as Germany, France, Italy, Spain, U.K., Poland, Russia and Rest of Europe is included in this chapter. India, Japan, Australia and New Zealand and rest of Asia Pacific are the leading countries in the APEC region that are the prime subject of assessment to obtain growth prospects of the APEC post herpetic neuralgia treatment market in this chapter. Readers can find thorough information about the growth parameters of the APEC Post herpetic neuralgia treatment market during the period 2018-2026. Readers can find important factors that can make a huge impact on the growth of the post herpetic neuralgia treatment market in China based on the market segmentation, during the forecast period. This chapter provides the overview of regulations, drivers, restraints, and trends in the China post herpetic neuralgia treatment market. This chapter provides information on how the post herpetic neuralgia treatment market will grow in the major countries in MEA region, such as GCC Countries, and South Africa, and rest of MEA during the period 2013-2026. In this chapter, readers can find a comprehensive list of all the leading stakeholders in the Post herpetic neuralgia treatment market along with detailed information about each company, including company overview, revenue shares, strategic overview, and recent company developments. Market players featured in the report include Pfizer Inc., Teva Pharmaceutical Industries Ltd., Mylan N.V., Endo Pharmaceuticals Inc., Daiichi Sankyo, Acorda Therapeutics, Purdue Pharma L.P, Teikoku Pharma USA, Inc., Janssen Pharmaceuticals, Inc. This chapter helps readers to understand the research methodology followed to obtain various conclusions, important qualitative information, and quantitative information about the post herpetic neuralgia treatment market. The post herpetic neuralgia treatment market is largely dominated by large vendors who are competing on the basis of market penetration and distribution. However the consolidated nature of the post herpetic neuralgia treatment market fails to increase the profitability of the business owing to loss of patents and poor efficacy and efficiency of the treatment. However, growing awareness about the post herpetic neuralgia treatment and the growing geriatric population have increased the revenue opportunities for global post herpetic neuralgia treatment manufacturers. Companies, such as Pfizer Inc., Teva Pharmaceutical Industries Ltd., Mylan N.V., Endo Pharmaceuticals Inc., hold more than 50% revenue share in the global post herpetic neuralgia treatment market. The growth of the global post herpetic neuralgia treatment market is primarily driven by growing prevalence of post herpetic neuralgia and geriatric population. The development of healthcare infrastructure around the world coupled with the governmental support to post herpetic neuralgia treatment products is also expected to drive the growth of the post herpetic neuralgia treatment market. However, the poor efficacy and efficiency of present post herpetic neuralgia treatment drugs are factors expected to hamper the growth of the post herpetic neuralgia treatment market. The companies are involved in developing new experimental post herpetic neuralgia treatment drugs. The growing screening rates and the increase in geriatric population are the critical drivers of the post herpetic neuralgia treatment market. According to the Center for Diseases Control and Prevention, Shingles is increasing among adults in the United States. The prevalence of singles in is approximately 4 to 5 people per 1000 according to the Center for Diseases Control and Prevention, 1 out of 3 people in the United States will develop shingles during their lifetime. The incidence rate of shingles ranged from 3.2--4.2 per 1000 population per year translating into an estimated 1 million cases annually of which approximately 10-18% develop post herpetic neuralgia in the U.S. Thus a large unmet need for the post herpetic neuralgia treatment market is easily comprehendible. Post herpetic neuralgia generally affects adults, aged 50 and older and who are largely immunocompromised. According to the Center for Diseases Control and Prevention, among persons experiencing shingles, age is the primary risk factor for the development of PHN and the risk for PHN increases with age, particularly for persons aged >50 years. Approximately 80 %-8 5% of PHN occurs in zoster patients aged greater than 50 years. The technological advances such as the development of the capsaicin and lidocaine has generated a large market enthusiasm in the global post herpetic neuralgia treatment market. Increasing investments in the research and development coupled with the development of pregabalin is expected to generate momentum and growth opportunities for the post herpetic neuralgia treatment market. Concerns over opioid use and the growing mortality from overdose are the prime constraints on the post herpetic neuralgia treatment market. Opioid overdose deaths account for 49,000 of the 72,000 drug overdose deaths in the USA in 2017. According to the center of disease control, around 66% of the more than 63,600 drug overdose deaths in 2016 involved an opioid and on average, 115 Americans die every day from an opioid overdose. The lack of definite curative treatment and the poor efficacy and efficiency of drugs is also hampering the post herpetic neuralgia treatment market growth. New drug development is the large market opportunity for the post herpetic neuralgia treatment market. The development of any curative post herpetic neuralgia treatment drug is expected to drive a faster market adoption with minimal resources owing to lack of competition in the post herpetic neuralgia treatment market. Symptomatic treatment is the chief goal of post herpetic neuralgia treatment as there is no treatment for post herpetic neuralgia treatment. The support to post herpetic neuralgia treatment products and initiatives by the governments of different countries is the other factors expected to boost the growth of the post herpetic neuralgia treatment market. Demographic drivers of the post herpetic neuralgia treatment market include the ageing of the world population and the growing healthcare expenditure around the world. In North America post herpetic neuralgia treatment market, the U.S. is the dominant market due to larger economy and large purchasing power. The excellent reimbursement and growing incidence of post herpetic neuralgia treatment are also expected to support the growth of the post herpetic neuralgia market. Besides, presence of large players such as Pfizer, Endo pharmaceuticals and others is also expected to drive the growth of the post herpetic neuralgia treatment market in the U.S. The healthcare expenditure in the U.S. was almost 16% of its GDP in 2017, which amply reflects better pricing and market attractiveness for post herpetic neuralgia treatment market. According to the Center for Disease Control (CDC) estimates the mortality of heart disease is around 630,000 each year, which costs about US$ 200 billion each year. The growing healthcare infrastructure as well as healthcare expenditure of Europe, which accounts to average 10% of GDP, are factors driving the growth of the Europe post herpetic neuralgia treatment market. Other European nations with a sizeable post herpetic neuralgia treatment market are France, the U.K., Italy and Spain. The Asia Pacific post herpetic neuralgia treatment market is dominated by Japan, India and Australia and New Zealand. The Middle East and Africa post herpetic neuralgia treatment market is dominated by the gulf countries owing to their high wealth and large public healthcare expenditure, which is approximately 75% of the GDP. The development of large specialty hospitals with greater purchasing power is driving a faster adoption of post herpetic neuralgia treatment products. The consolidation of large healthcare providers coupled with greater healthcare insurance penetration is another driver of the post herpetic neuralgia treatment market. Calcium-channel blockers such as gabapentin and pregabalin are first line agents in the post herpetic neuralgia treatment. Tricyclic antidepressants (TCAs) possess analgesic effect, at lower doses than are required for their psychological effects. Their lower cost is another driver of the post herpetic neuralgia treatment market. However their side effects such as sedation, dry mouth, constipation, and urinary retention and orthostatic hypotension restrict their use. Their use is also contraindicated in patients with cardiac conditions. Amitriptyline and nortriptyline are the most used TCA’s for post herpetic neuralgia treatment. Steroids such as corticosteroids are administered in the terminal stage of post herpetic neuralgia treatment. However they have been limited by their side effects and poor efficacy. Opioids such as oxycodone, morphine and methadone are third line post herpetic neuralgia treatment agents owing to their abuse potential and side effects such as constipation, nausea, itching, and sweating. Lidocaine and capsaicin patches are used in post herpetic neuralgia treatment despite limited evidence supporting their use. Competition section of the post herpetic neuralgia treatment market features profiles of key players operating in the industry based on their market shares, differential strategies, product offerings, marketing approach and company dashboard. Some of the key players operating in the post herpetic neuralgia treatment market include Pfizer Inc., Teva Pharmaceutical Industries Ltd., Mylan N.V., Endo Pharmaceuticals Inc., Daiichi Sankyo, Acorda Therapeutics, Purdue Pharma L.P, Teikoku Pharma USA, Inc., and Janssen Pharmaceuticals, Inc.
Post herpetic neuralgia (PHN) is characterized as moderate to severe nerve pain due to damage to a peripheral nerve caused by the reactivation of the varicella zoster virus (shingles). PHN is nerve pain which persists for more than 30 days after the reactivation of herpes zoster. The nerve pain is a result from damage to the peripheral nerve. PMR conducted a research study on post herpetic neuralgia treatment market for the forecast period 2018 to 2022. 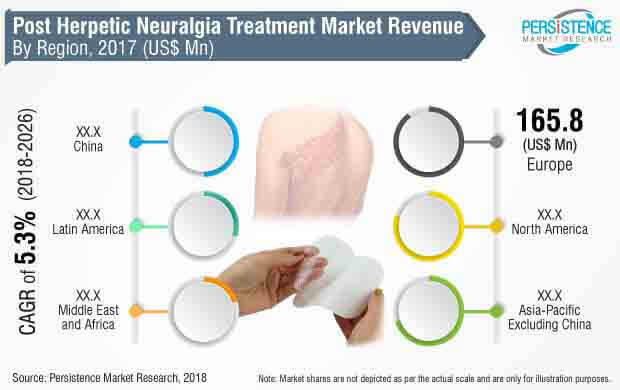 The post herpetic neuralgia treatment market report offers a comprehensive evaluation of the business opportunities prevailing in the post herpetic neuralgia treatment market along with insights on the post herpetic neuralgia treatment consumption trend, disease incidences, and awareness level for post herpetic neuralgia treatment market competition. The report elaborates on the macroeconomic factors influencing the dynamics of post herpetic neuralgia treatment market and its futuristic potential. The report offers a comprehensive taxonomy of post herpetic neuralgia treatment market based on treatment type, distribution channels and region. The treatment type segment of the post herpetic neuralgia treatment market includes drugs, patches and steroid injectable. The drug segment of the post herpetic neuralgia treatment market is sub segmented by anticonvulsants, antidepressants, and opioids. The patches segment is sub segmented by lidocaine skin patches and capsaicin skin patches. The distribution channel segment of the post herpetic neuralgia treatment market includes institutional sales and retail sales. The institutional sales includes hospital pharmacies, and clinics. The retail sales includes retail sales, retail pharmacies, drug stores and mail order pharmacies. The post herpetic neuralgia treatment market has been analyzed across regions of North America, Latin America, Europe, Asia Pacific Excluding China, China and MEA. What is the revenue potential of point of care post herpetic neuralgia treatment across regions of North America and Europe? Who are the key competitors and what are their portfolios in post herpetic neuralgia treatment market? What are major challenges influencing the growth of post herpetic neuralgia treatment market? How intervention from regulatory authority is shaping the post herpetic neuralgia treatment market growth? The post herpetic neuralgia treatment market has been estimated based on supply-demand approach. The market was first calculated based on incidence and diagnosis rate, conducted in different region/countries. Other qualitative factors analyzed during the estimation include treatment rates for post herpetic neuralgia treatment, recurrence rate and others. This information is further validated with rigorous primary research (including interviews, surveys, in-person interactions, and viewpoints of seasoned analysts) and secondary research (including verified paid sources, authentic trade journals, and resourceful databases). The research study on post herpetic neuralgia treatment market also includes top trends and macro as well as micro economic factors shaping the post herpetic neuralgia treatment market. With this approach, the report on post herpetic neuralgia treatment market anticipates the industry attractiveness of every major segment in post herpetic neuralgia treatment over the forecast period.